Recently I had the opportunity to present on my journey deploying vSAN 2-node clusters at the Central Ohio VMUG UserCon, as well as a local Pittsburgh VMUG event. Overall, it was a great experience and I’m thankful to have had the opportunity! 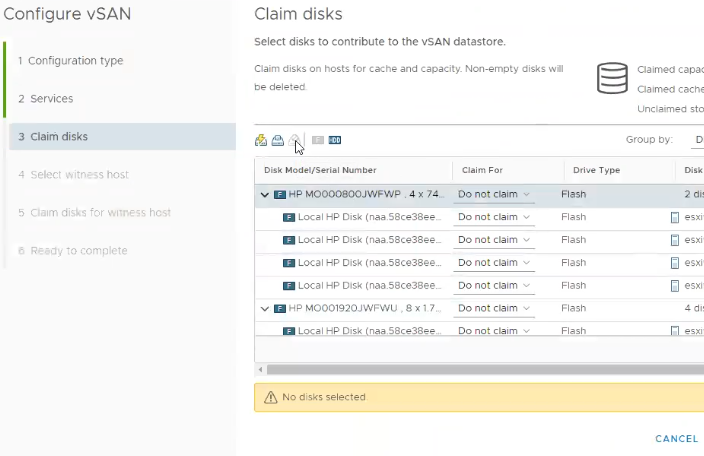 Check out the recording of the session below, and don’t forget to check out my post on Building a 2-node Direct Connect vSAN cluster. Feel free to download the slide deck for this presentation. Thanks to Ariel Sanchez for not only recording the session and uploading to the vBrownBag channel, but for pushing me to give this presentation in the first place! What is vSAN RAID 6 Erasure Coding? RAID 6 is a type of RAID that leverages 4 data bits with 2 parity bits. VMware vSAN uses erasure coding (a term that means to encode and partition data into fragments) to split data into the 4 data and 2 parity components. Those computations of erasure coding have a performance impact, and that is why VMware requires all flash storage in order to use RAID 6 erasure coding policies. The use of erasure coding affords a considerable capacity improvement. For example, when using RAID 1 for an FTT=2 policy, the storage multiplier is 3x – a 100GB VM will consume 300GB. With RAID 6, the storage multiplier is only 1.5x. That same 100GB VM will only consume 150GB. Check out the Virtual Block’s blog for some great info on the use of erasure coding in vSAN. Additional information on vSAN RAID 6 requirements can be found here. Before getting into vSAN configuration specifics, it is best practice to separate hosts physically. This is commonly accomplished by splitting hosts in a cluster among multiple racks. Those racks should be spread out as much as is possible. The only requirement is a sub-1ms RTT between hosts in the cluster. Given that using RAID 6 erasure coding policies have a minimum 6 host requirement, it would be ideal to split a cluster into 6 or more racks. vSAN uses what is referred to as fault domains to represent the physical grouping of hosts. In many cases, one fault domain represents one rack of hosts. VMware’s documentation for managing fault domains on vSAN is very helpful, and I recommend giving it a read. However, that post indicates the formula for achieving FTT=2 with fault domains uses the formula 2*n+1 where n is the desired FTT value. Using that formula would indicate that 5 fault domains would be enough to satisfy the requirement. That formula does not hold true for RAID 6 policies. If you refer back to the the 6 components (4 data + 2 parity) used in RAID 6 policies, vSAN will distribute those components across the configured fault domains. In short, if you want to leverage fault domains with RAID 6 erasure coding policies, there must be at least 6 fault domains. If the cluster being designed has exactly 6 nodes, or an odd number of nodes, there is no drawbacks to putting only one host into a fault domain (even if other fault domains in the same cluster have more than one host). Although the use of fault domains is recommended, they are not required. RAID 6 policies will also work with no fault domains configured. At this point, the only remaining piece of the “puzzle” is to set up the SPBM policy for RAID 6. Assuming everything is set up correctly, this will be the easiest part. Simply create a new Storage Policy and select “2 failures – RAID-6 (ErasureCoding)” for the failures to tolerate option under vSAN rules. The next screen will show all of the vSAN datastores in your environment that are compatible with the RAID 6 policy. If you do not see the proper datastore in this list, change the drop down to show incompatible clusters, and hover over the incompatibility reason. If you see an error similar to “VASA provider is out of resources to satisfy this provisioning request”, or see symptoms outlined in VMware KB 2065479, verify that you have a proper fault domain count, and that they are configured properly. With 2018 coming to a close, I thought I would share a pet project that I’ve thrown a little time into off and on for the past few months. 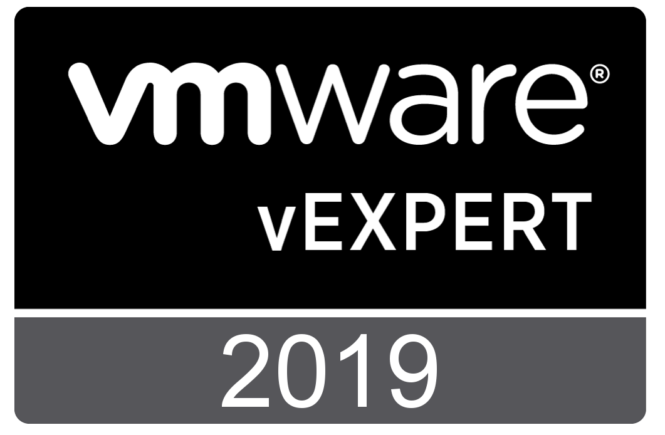 A good portion of my job in the first half of 2019 will be migrating hundreds of Microsoft Windows workloads from Hyper-V to vSphere. With any change in hypervisor, there are often steps that need to be completed on the VM to ensure proper functionality. My project has been to create a powershell module to facilitate those steps with Windows workloads. Get-IPInfo – Harvests all network settings (any number of NICs, any number of IPs per NIC, and even supports WINS) from a server prior to migration into a CSV file. My hope is for the community to provide feedback on improvements to the existing cmdlets, and also offer up ideas on what other migration steps could be automated. If this project matures, I would like to get it added to the Powershell gallery and add support for other OS families. Drop me a comment with an idea of how this module can be improved, and what you’d like to see added! 2-Node vSAN deployments can be a great choice for remote office/branch office (ROBO) scenarios, as it can be managed by the same vCenter as your other infrastructure. 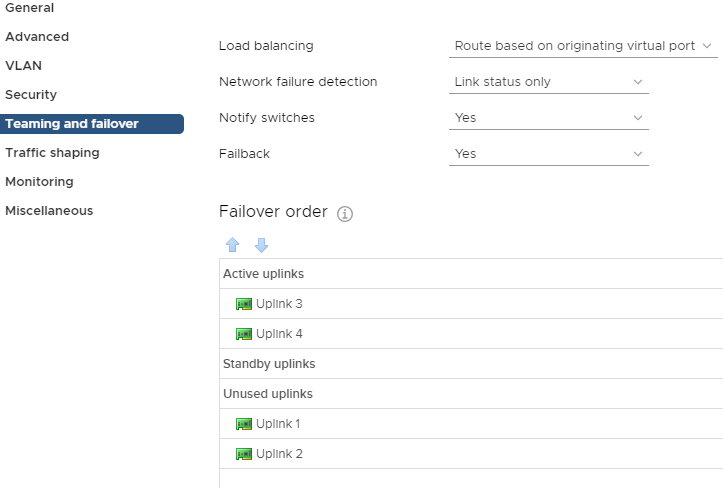 Setting up the 2 nodes in a direct connect configuration can be beneficial if the remote site has a) limited switch port availability, or b) no 10GB switching available. Note: Items in bold are of particular significance, as they were a sticking point for me during configuration. Paying attention to these items will save you a little trouble. Each design will vary depending on network capabilities at the location, VM workload size, etc. In my case, we had limited network availability and a very light VM workload for our vSAN ROBO clusters. For our physical design, we directly connected two 10Gb ports for vSAN traffic, and two other ports for mgmt/VM/vMotion traffic. Our configuration incorporates NIC card/controller redundancy, as any configuration should. In a more demanding environment, I would recommend splitting the vMotion or VM traffic out onto its own vmk using separate ports. This image illustrates our logical wiring design (sans iLO). Once all the cabling and IP requirements have been satisfied, ESXi 6.7 can be installed following your normal procedures. Ensure that all disks that will be used by vSAN are configured in pass-through mode, and have caching disabled on their storage controller. Don’t forget to set the NTP server configuration on the hosts! vSAN is completely dependent on proper network configuration and functionality, so it is important to take extra care during the setup of the DVS and port groups that the vSAN cluster will be using. In my case, these were the first vSphere deployments at their respective sites, so we created a new Distributed Virtual Switch (DVS) for each datacenter with 4 uplinks. Then, 2 port groups need to be created within those DVSs. The first port group is for host management, VM traffic, and vMotion and will be set to only use uplinks 1 and 2. Traffic on that port group will be load balanced based on physical NIC load. 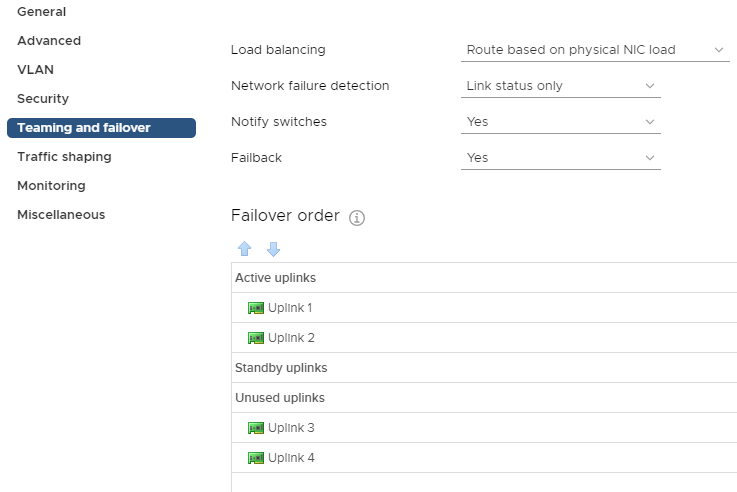 The second port group will be used for vSAN traffic only, and should be configured to only use uplinks 3 and 4. At this point you’ll add your new hosts to the DVS. Assign the vmnic ports designated for management to the appropriate port group, and assign the vSAN vmnic ports to the newly created vSAN port group. Then, migrate the management vmk to the correct port group. The hosts should not be running anything through the standard vSwitch. This is a good opportunity to make sure you have vMotion enabled on the management vmk. 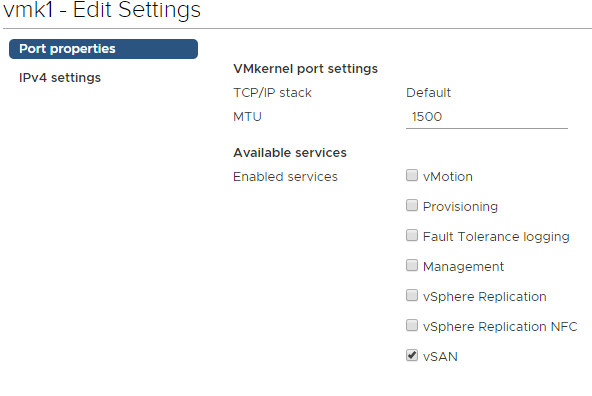 Add another VMkernel port and attach it to the vSAN port group, with vSAN being the only enabled service on the vmk. This will need to be done on each host. vSAN 2-node deployments require a witness appliance to maintain quorum. The witness is simply another ESXi host running in an alternate site. VMware provides a virtual appliance available for download on their website that can be deployed within your environment. Deploy the OVF at your witness site, and be sure to split the witness and management networks onto different subnets. It will need to be configured similar to any other host in your environment. Upon completion, right click your witness site datacenter object in vCenter and add your witness host to it. Up until this point, the witness appliance was simply a VM running ESXi, but it needs to be added to vCenter as a host in order to function as a vSAN witness. Once added, navigate to the VMkernel configuration for the witness appliance and modify the witness vmk so it uses the static IP obtained earlier. Be sure to check the box to override the default gateway for the adapter, and enter the gateway for the subnet the vmk resides on. Two vSAN hosts are configured and reside within the ROBO site datacenter in vCenter. 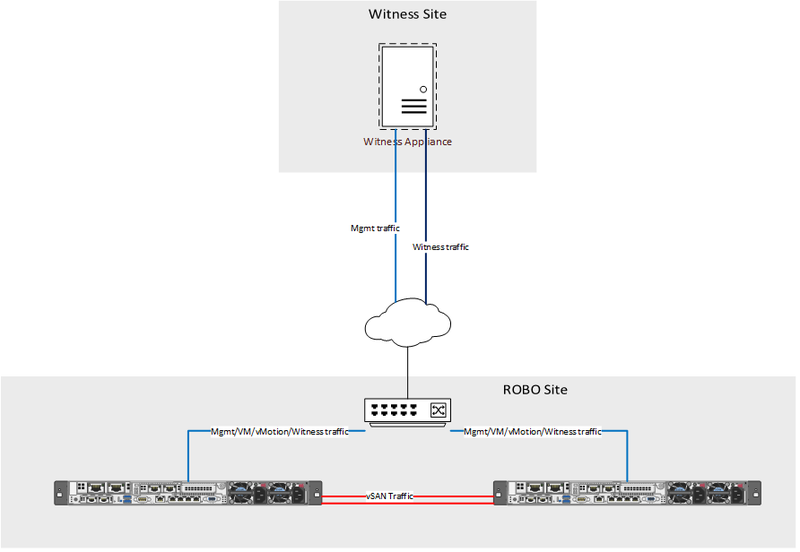 One witness appliance is configured and resides in the witness site datacenter in vCenter. A cluster has not yet been created, and vSAN is not enabled. Before creating the vSAN cluster, patch the hosts and witness appliance to the latest version supported in your environment. It is recommended that the witness appliance runs at the same patch level as the nodes in the vSAN cluster. Typically, that is all that is required for enabling vSAN for two host deployments, however direct connect clusters require an additional step. By default, vSAN sends witness traffic over the vSAN network. As can be seen in the image above, the vSAN network is directly connected to the other host, and is not routable for the witness. To fix the witness communication issue, a static route needs to be added to each of the vSAN hosts. You should see vmk1 used for vSAN, and vmk0 used for witness traffic. The only remaining tasks are to enable HA and DRS (license permitting) and to license the cluster. Within vCenter, navigate to your new vSAN cluster -> Monitor -> vSAN -> Health and run a retest of the vSAN health. Assuming everything else has been configured properly you should be welcomed by a screen of green check marks! While deploying vSAN clusters on HPE servers, I came across a problem. The vSAN wizard did not display the physical bay number of the drive, so I had to figure out another way to associate the displayed NAA ID of the drive with the physical drive location. In my situation, I want drives in bay 1, 3, and 5 to be in disk group 1, drives in bays 2, 4, and 6 to be in disk group 2. To visualize this end goal, check out the image below. The output will look something like this, with an entry for each drive. Pay attention to the highlighted WWID value. I have intentionally left off the last character. The highlighted string is the same as the NAA ID that appears in the vSphere wizard, minus the last character. We now know that the drive in this example belongs in bay 4, and is a capacity drive in disk group 2. Similar to this example, you can now use the output for the other drives to identify their physical location of each NAA value, and assign it to the proper disk group for your design. Alternatively, you can use the serial number (removed from this example) to match up with what you can find in the iLO interface. However, logging into every host and running the command can be a bit tedious. Instead, I threw together a quick powershell script that leverages Plink to pull that information from specified hosts. You could easily modify the script to process multiple hosts at once or process the output however you like. $cmd = "/opt/smartstorageadmin/ssacli/bin/ssacli ctrl slot=0 pd all show detail"
Write-Verbose -Message "Executing $cmd on $vmhost"
I'm a Systems Engineer working in Pittsburgh, PA with a passion for automation and all things tech.